#AWSConnect Call Center Deployment Check List! (a) No “Per Agent” seat license! On average the current crop of cloud based vendors from Five9, through Incontact and Genesis you will be looking at a per agent seat price of $140 – $298 per seat, per month for base functionality. Now did you want meat on that bun? Features like email routing, Salesforce connectors etc will up your cost per seat. Also what happens to your licenses when you scale up or down? Do you have to buy licenses for your seasonal peaks? Named licenses or Concurrent licenses? (b) Telecom Service costs are still the base cost for all providers who do not own their own carrier! All providers obtain their DID numbers, inbound (termination) and outbound (origination) services from the same gene pool. The issue is what will you be paying? Retail or Wholesale? Wholesale pricing would average at $1 a day for a DID number and .018 per minute per call. If you are paying more than that, you are at a marked up Retail price designed to increase the profitability of your Cloud vendors solution. (c) Call Center typically use a variety of ancillry services that include database engines, storage systems, encryption and key management services. What about advanced functionality like Natural Language speech recognition and deep AI learning? Find out how much a Nuance license will cost you from your current Vendor? How about Text to Speech? (What do you mean you call center cant handle bots”)? AWS has a growing base of over 80 services from email to database to server less code! (d) Redundancy, Reliability and Business Continuity strategies and costs? Every cloud provider will walk you through the magical world of high availability cloud services! They all say pretty much the same thing when it comes to the subject of resiliency and fail over. What they are less obvious about is the cost of implementing their baked in strategy. Yes every platform providers will tell you they have two platforms one on the east coast and one on the west coast and fail over is transparent and automatic. Between the vision and the reality is a leap of faith! Remember if you have an MPLS link to one platform, you will need to pay for another to the other platform, a real cost to your business that is not in your vendors solution quotation! 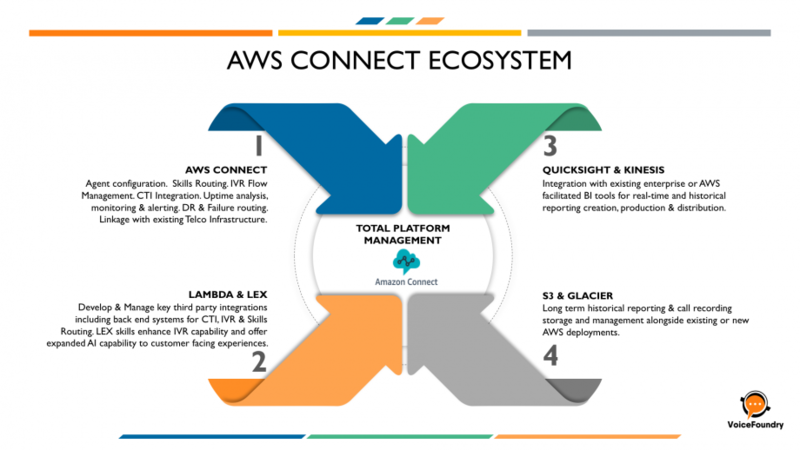 (e) EcoSystem Partners – Most cloud call center vendors have relationships with Work Force Management, Recording, Analytics and CRM providers rather than develop that technology in-house. For a variety of reasons, most cloud Vendors to not offer all available solutions. Nice for example, who owns InContact, might find it difficult to offer a WFM solution by another provider. (a) The AWS solution has no license fees for Agents, Supervisors or Administrators! (That fact alone should wipe out any need for further discussion, but lets continue anyway)! The most popular word in AWS IaaS is “elasticity”! No need to build excess capacity for seasonal changes. AWS can scale up or down, in or out as required and you only pay for what you use! (b) AWS Telecom rates are published and are as close to Wholesale as you will see in the dial tone market! (c) LEX (think Alexa) and Polly (text to speech) are key elements of the AWS IaaS platform. It is the 21 Century and we still prompt callers to “Press 1 for English”? If you call center is not smart enough to answer the phone and figure out what language the caller prefers, then you have a serious short fall in functionality! We use to worry about how many servers would need to maintain to support our SQL like data dips in support of our call flow strategy. With AWS Lambda and Dynamodb we no longer need servers! (d) While the other guys are talking about their two platforms, AWS is boasting some 16 regions around the globe. Each of these Regions has at least two or more availability zones. Deploying Auto Scaling and Load Balancers across regions enable you to be assured that should a Region be down (very unlikely) along with all of its Availability zones, your applications magically appear in another Region. Using AWS Route 53 DNS services, your domain records are updated auto-magically and life goes on through the outage, completely transparent to your business! (a) What reports does management require? – The best design of a call center requires and upfront detailed understanding of what Key Performance Indicators need to be tracked and reported in both Real Time and on a Historical basis. (b) Call Flow and Marketing? – Why “Press 1 for Spanish” if Marketing is launching a targeted program that could drive different market segments to specific phone numbers! Now is the time to outline and understand what Marketing agenda is on the horizon that will impact the Call Center. (c) Prompts and Voice Artist – While documenting the Call Flow – the experience a caller has when they reach your Call Center – It is very costly to have deployment programs put on hold while the implementation engineers wait for the script and recordings that define and support call flow! (d) CRM and Data Farm requirements – Will the Call flow required integration with internal databases? Who is going to write the SQL select? OBDC or WebServices required to integrate theses resources? Do you have a SalesForce Administrator or Fusion developer on your team? (We do). (e) WFM? Has this resource been identified or do you need some assistance sorting this out? (f) Social Media Integration? Do you need a Facebook feed to this call center? (g) Website Integration? – Can people open a voice, video, text or chat session from your corporate website to agents in your call center? (h) Phone System Integration? AWS Connect is a “call center” not a phone system! Lets figure out how this plays in your organization. Will agents us soft phone or hard phones? (i) Network Assessment – Is your network voip ready? As you move more Infrastructure to the cloud, you will increase your bandwidth WAN requirements. How many locations? This should be a very necessary part of the deployment plan. (j) Training – Both initial to support “go live” and ongoing resources to support your organization as new team members are added to the mix! DrVoIP, an AWS Partner member, can be of significant assistance and remains among the few AWS deployment resources outside of AWS that has the hands on expertise to deploy your call center on time and on budget. You need to give the DrVoIP team a call or text the keyword “AWS” to 424-348-4000 and we can arrange to bring up a pilot install in less than a day!